Something Underground Theatre Company was founded by Jonathan Brown in 2006. Since then Something Underground has been creating one man, one woman and ensemble plays that have touched many lives. Jonathan writes all of SUTC’s plays . The work tends to be visceral and uncompromising text, character and plot driven works. Plays have been about (amongst other things) fatherhood, identity, wounds, alcohol, childbirth, the myths of mental health, community, the meat industry, food, the tobacco industry, about Victorian Brighton, greed and corruption, unseen forces, Regency Brighton, and more recently, the Holocaust. The plays ask the audience to use their imaginations. We use physicality to portray the worlds we inhabit, and very little in terms of props or set. Some of the work includes enhanced use of physical theatre (e.g. The Well), and some includes intensely interspersed multilayered verbal dialogue (e.g. The Last Lunch). Jonathan’s improvised work (e.g. Je Suis) uses an empty stage, the moment, and whatever beings inhabit the space to create fragile or robust worlds, where mysteries may or may not emerge. Until 2010, SUTC focussed on one man works written and performed by Jonathan, with The Father Monologues (Part 1), Large Print Trash (Best Male Performer (nom) Brighton Fringe 2007), The Father Monologues (Part 3) and Licence. In 2011, we moved into working in ensemble, with The Well. 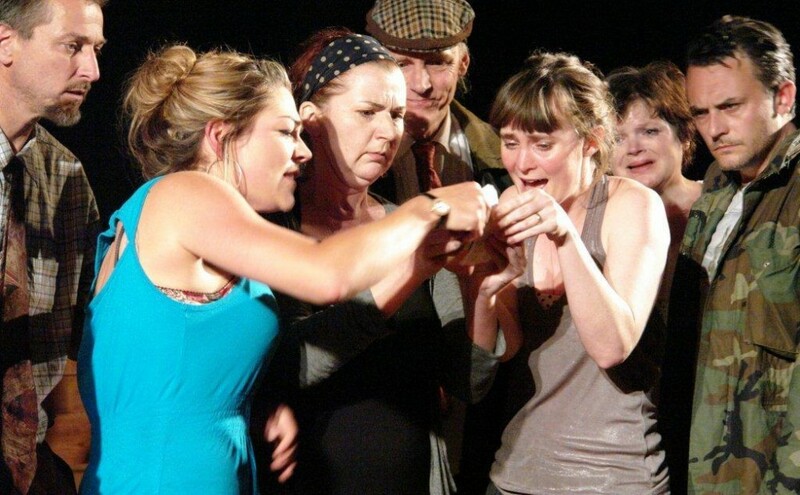 In 2012 the next play for a cast, The Last Lunch was a winner of best new play in the Brighton Fringe. In 2014, The Last Lunch was back again, alongside a new production of Betsy with Elle Dillon Reams, and a new one woman show, Smoking Ban (with Kate Goodfellow, who’s portrayal of Carol in Smoking Ban won her Best Female Performer at Brighton Fringe). The year was rounded off with a new one man show from Jonathan called Iron John, an improvised show based on the Grimm Brother’s tale, with musical score from Andrew Scullin. In 2015 performances of Iron John continued (with new musician Simon Scardanelli), plus Jonathan’s new entirely improvised one man show, “Je Suis: A Fool’s Guide to Cliff Edges” (also with Simon providing live music). Following a 2nd successful “Create your Own One Person Show” Course in October 2014, SUTC supported two new one person show productions in The Brighton Fringe May 2015, Moon Tales written and performed by Kate Darach and Pulling Up The Drawbridge written and performed by David Stephens. Both directed by Jonathan. Both were very successful. “A Good Jew” (our new multiple-cast play) toured in 2016 to excellent reviews and packed houses. We are currently preparing a reading (on 18th Nov 2016) of our new play for a cast: “I, Refugee”, which we hope to produce in 2017. Jonathan leads classes in performance and creating one person shows.